Hello, I have bought an odroid c2 from you 2 weeks ago. It worked fine for a week but then after a reboot, the odroid stopped reading the sdcard Odroid forum post. Since then, I have rma'd the sdcard (which was bought from amazon, its a samung sdcard evo 16gb class 10) and received a new one today. You said you have bought a new microSD card from Amazon but it looks like it is still a Samsung card. Sandisk card are better supported than Samsung that tends to be more problematic even new ones. Other possibilities is Hardkernel image used (some tends to be problematic) and the way you have created your image (dd is far better than Win32DiskImager). Ok, you can put the RMA request on hold, I bought a sandisk class 10 8gb sd card from amazon and should be arriving this friday. If this doesn't solve the problem we will proceed with the RMA. EDIT: I want to point out I downloaded the latest ubuntu image from the official odroid germany mirror (the 28th february image) and I checked the md5 hash before flashing it. And yes, I used win32diskImager. Later I will try with my rpi and dd. 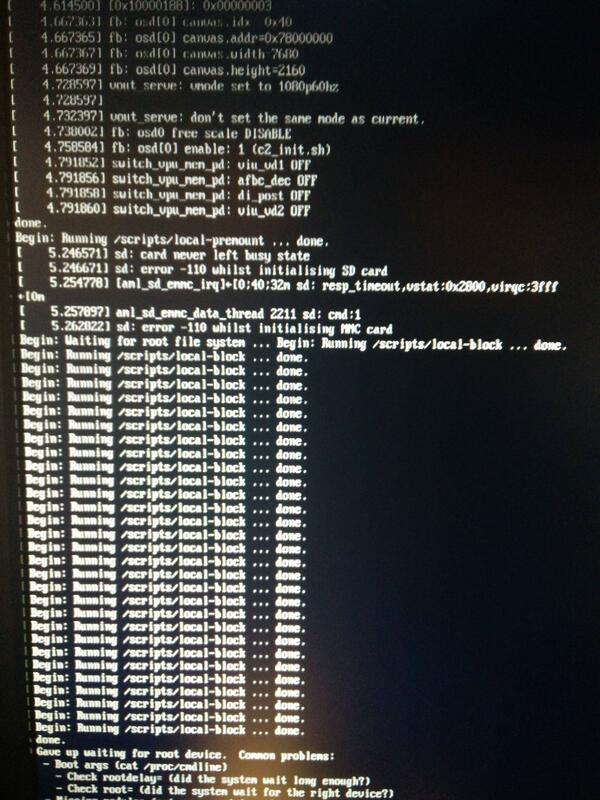 * ARM 64bit is a very new platform and some system specific Linux softwares are not working stably at this moment. * Ubuntu 16.04 LTS is also on the alpha stage and it causes the instability and incompatibility problems. Early image may be unstable in some conditions. I will also try to flash the android image provided by them. Anyway, what you are pointing out should be a widespread issue, and would be reported inside the official odroid forums.. The ones having my exact same issue are being redirected by the odroid staff to compile a RMA form. Search for "won't boot" inside the Issues sub forum in the odroid c2 official forum. Just a quick update: I flashed the android image provided by odroid (which I assume it's stable, since they don't say otherwise). I even successfully verified the image (!! ), I inserted it in the odroid c2 and it showed me the hardkernel logo for 2 seconds, then the blue led shut down and now it doesn't do anything. I repeat, I verified the image succesfully. Just brainstorming; are you using a specific up to date Linux distribution or Windows to flash your microSD card? Are you using dd? I used both dd and win32diskImager, and I downloaded/flashed both the official android and ubuntu images provided by odroid. Anyway, I followed the advice from odroid official forum and bought a sandisk 8gb class 10 sd card, which is the recommended sd, and did flashed an ubuntu image on it... The result was the same, odroid wouldn't boot, spouting errors everywhere about bad sectors on sd card (bear in mind, the sd card is 1. new 2. recommended by odroid). I tried android too - got the image with the red altert sign and an android behind... the first time, second time I got a black screen after showing the hardkernel logo. I think this is the confirmation that the odroid I received is faulty. How can we proceed with the RMA? I need a new odroid for my server project at home. Once it is done, we'll give you the address to return the product. We can refund it. For the replacement, we are currently out of stock. We'll be able to ship new Odroid-C2 at the end of April as Hardkernel will have it in stock again. If it's possible I'd like have a new model as soon as it comes through from hardkernel, instead of buying one again. If it's not possible then we shall proceed with the refund. By the way I have already filled the return form (I filled it the 30th of March 2016) and I am awaiting instructions as to where to ship it.